The Cydia Store is awash with various little tweaks for modding various elements of the iOS interface. 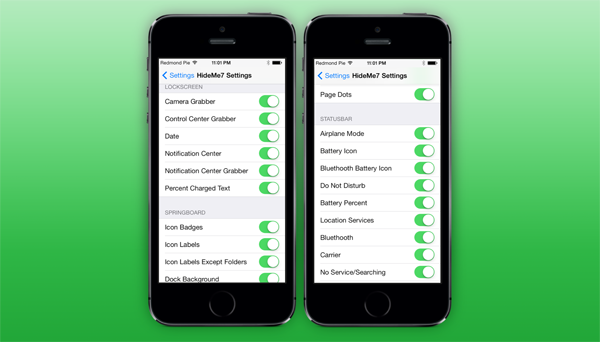 But like Springtomize, which essentially encompassed 20+ different tweaks in one hit, HideMe7 looks to be the one-stop hunt for anybody looking to hide segments of iOS 7 that they do not want to see. Even at its current initial-release state, it’s already pretty extensive, and if you like to keep things as subtle, understated and minimal as feasibly possibly, this is one you’ll want to be checking out. All-in-one apps are rare in the world of jailbreaks, mainly because folks have varied ideas about what iOS needs and what it doesn’t. But changing the look of things en masse is something that many jailbreakers seem united in striving for, which would go a long way to explaining why the likes of WinterBoard, DreamBoard and the aforementioned Springtomize have been so successful. 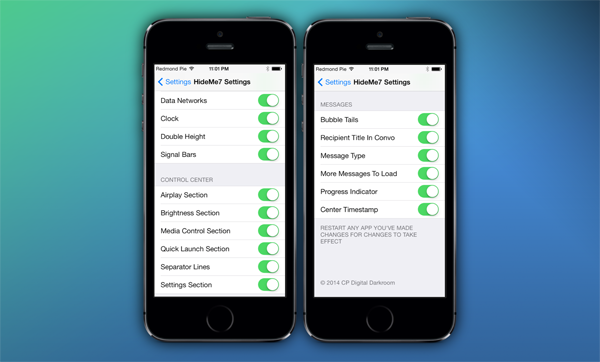 HideMe7 follows in very much the same vein, but while most theme-based tweaks and apps giveth, HideMe7 taketh away. However, while iOS 7 is very clean and easy on the eye, it is quite over-zealous at times, and therefore, it stands to reason that some would want to remove certain bits and pieces. From the page dots and separator lines to more significant effects like Control Center toggles, you can remove features and aesthetics that you neither want nor need, and with the developer open to new suggestions, this jailbreak app could well become one of those must-download Cydia entries – if indeed it isn’t already. HideMe7 costs 99 cents, and can be downloaded over at the BigBoss repository. For the kind of functionality on offer, I would expect to pay double or even treble what the developer is asking for this tweak, so in terms of value, HideMe7 is certainly a worthwhile investment. If you have a few nagging UI elements, toggles or menus that you’ve been wanting to remove since you first clapped eyes on iOS 7, now’s your chance to banish them from your device for good.